infoWHY USE THE HANDBAG SPA? Effective water based cleaner and protector kit for nubuck, suede & fabric handbags. Great for linings too! Kit includes x1 Antibacterial Cleanse 60ml and x1 Hydro Protect 60ml. Scientific tests have proven that a handbag can carry more bacteria than your average toilet seat! Gross right? Well here at The Handbag Spa we have developed an anti-bacterial cleanser proven to kill 99% of common bacteria keeping your handbag healthy and clean. Not only that but our specially developed anti-bacterial product can be used on ALL types of leather and fabric meaning you can use it on your entire handbag and purse collection! Rain can be a girls worst nightmare when your carrying your favourite suede bag, and we all no how unpredictable the weather can be sometimes, so why risk it? 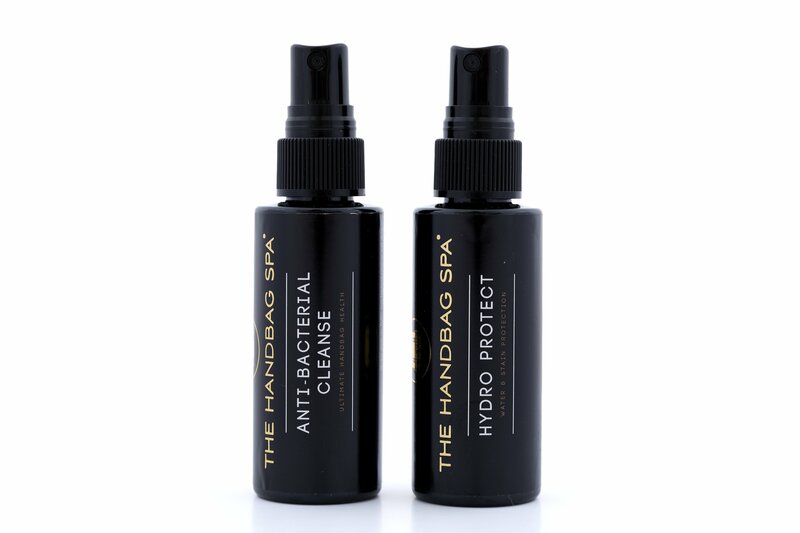 Here at The Handbag Spa we have developed a waterproofing spray for handbags which means you can carry your prized suede bag whatever the weather! Whats different about our product is it’s non-solvent and fragrance free. It not only gives you the ultimate liquid protection for your suede and fabric bags but it is pleasant and friendly to use in comparison to your more traditional solvent scotch guard sprays in a can. For How To Use instructions, see individual products.